Today the WINGS team is releasing a white paper, “WINGS: A project backing social platform with incentivized forecasting”, describing an user-experience focused system designed specifically for the curation, forecasting, backing, and governance of smart contracts controlled DAOs running on Bitcoin and other smart contracts capable blockchains. 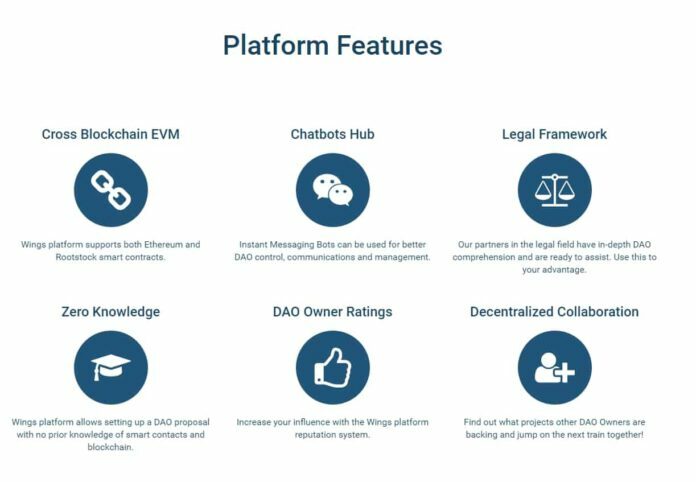 increases decision-making efficiency through AI-assisted DAO governance. Today’s entrepreneurs live in an interconnected global economy yet face many hurdles in establishing a truly global footprint for the next big thing. The challenges of bringing a great idea to reality range from adapting to language and cultural differences, establishing trust, enforcing contracts, navigating between varying regulatory regimes, having an adequate quality workforce, and accessing capital assets globally. Bitcoin provides a novel way of conducting financial transactions in a censorship-free, borderless, and immutable space secured by the most powerful computer network in the world, the Bitcoin blockchain. Combined with the capability of a flexible smart contracts engine it enables the public to form a new type of organization, Decentralized Autonomous Organizations (DAO), where enforcement of contracts is secured by the immutability of decentralized blockchains. DAOs can lower costs for trust and contract enforcement, provide a global network to bridge across varying regulatory regimes, as well as provide an easier access to a global network of human and computing asset resources. To obtain a complimentary copy of “WINGS: A project backing social platform with incentivized forecasting”, please visit https://wings.ai. WINGS is a decentralized team of blockchain professionals, aiming to bring the DAO’s to mainstream by making them accessible to entrepreneurs and companies, that is looking to leverage the power of forecast markets for a higher quality decision-making, the versatility of smart contracts for a global decentralized agreement framework, and the ease of use of the instant messengers for an increased audience reach. WINGS is scheduled to be launched in beta version by the end of 2016, with the team arranging private demonstrations to the potential DAO.